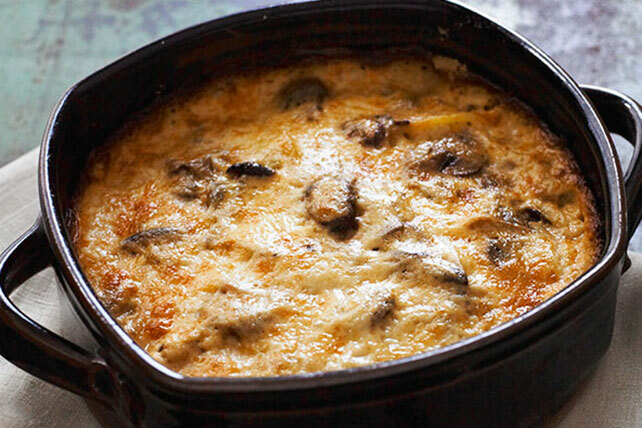 This au gratin potatoes dish with mushrooms is the perfect complement to a holiday meal, but we wouldn’t blame you for making it for non-holiday meals too. Melt 1 Tbsp. butter in large skillet on medium-high heat. Add mushrooms; cook 6 min. or until tender, stirring frequently. Meanwhile, melt 2 Tbsp. of the remaining butter in medium saucepan on medium heat. Whisk in flour; cook and stir 1 min. Gradually whisk in milk, then sour cream; cook 4 min. or until thickened, stirring constantly. Stir in shredded cheese and pepper; cook 1 min. or until cheese is melted. Grease 3-qt. casserole with remaining butter. Layer 1/3 each of the potatoes and mushrooms in casserole; repeat layers twice. Cover with cheese sauce. Sprinkle with Parmesan; cover. Bake 1-1/2 hours or until potatoes are tender and top is golden brown, uncovering after 1 hour. Let stand 10 min. before serving. This sensational side dish pairs well with cooked lean meat or poultry. Prepare using KRAFT Shredded Mozzarella Cheese.